Last week Gabriel had an appointment to see the vet for his booster shots and a follow-up to the crystals in his urine. Mommy saw this as an opportunity to bring me in for a geriatric blood test. Of course, I protested. Who is she calling geriatric? I can run circles around that woman! The rest of the Monkeys have not yet met Gabriel, but I saw that little rotter through the holes of our respective carriers. I had to sit staring at him while the nice vet called him 'cute' and 'adorable' and showered affection on him all the while waiting for a 'geriatric' blood test. This will definitely cost Mommy some future snuggles. We didn't have a camera at the vet's but I gave Mommy my famous 'I do not approve' look through the wires of the cage. This is a recreation of that look. Finally it was my turn. The vet told Mommy that he does not believe I'm 12 years old because I am in remarkable shape. I think I might like that man! He took my blood and gave me a smooch. The blood results came back the next day and he called Mommy to tell her I'm perfect. All of my levels are normal to above-average. Shouldn't she have known this already? I think she needs a geriatric blood test if she can't figure that out just by looking at me! Mommy gets the Back of Disapproval for 2 weeks - 1 week with good behavior. P.S. Gabriel's exam went just as well as mine did so the humans will finally get to introduce him to Samson and Delilah next weekend. Irene was only a tropical storm by the time she got to us, but she somehow managed to knock out the power for almost the whole day yesterday. The power came on again at 11pm so I pushed Mommy to do my post. We sure hope everyone fared okay! I have been asked many times how I manage to keep my whites so white and my colours so vibrant. It is not an easy task when you have as much fur as I do. Of course the most important thing is to clean yourself as much as you can, but I do have other secrets to my well-groomed coat. One advantage I have is a HUGE tongue. I don't know why it's so big but I assume it's just proportionate to my large, manly shape. It's a lot easier to stay clean with a big tongue but I've also learned a good trick to really get all the dirt off. I'm thinking of patenting this move. It cleans both sides of the fur at once! Now I'm the cleanest Mancat around. Go ahead, just try to find a speck of dirt on me! 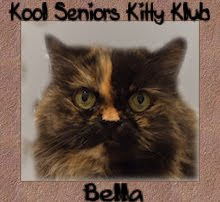 Maybe if Bella and Sweet Pea had let me help with their cleaning they wouldn`t have had to be shaved. You will never guess what happened to me! The humans thought Bella was so happy being free of her knots that they thought I'd benefit from a shave too. I didn't make it easy for the groomer, though. I fought tooth and claw to prevent this from happening. They had to put a muzzle on me! This is so humiliating. The humans will pay for what they've done! Just don't tell them that it feels nice and breezy and comfortable being knot-free. That might spoil my revenge. Daddy is very happy with the result because he says when I snuggle with him, it feels like he's snuggling a warm sausage. I may have to withhold snuggling privileges just for that remark alone. Mommy had some dental work done in the last week so she hasn't helped us blog very much. She is crabby and doesn't want to do anything so the girls and I have been showering her with attention. Deli is working hard giving Mommy her famous claw massages and drool infusions, and I've been doing my best to make her smile by looking as cute as possible. Even Bella is pitching in by conjuring up entertaining Birdie Shows with her magical powers. This is where she sits to concentrate. And then this is what the birdies do! I don't know about Mommy, but Bella's Magic Birdie Shows always make me feel better! It's a lot of hard work trying to make Mommy feel better, but we'll keep doing our best. I also wanted to remind you that the auction for Sammy, Andy, Shelly and their Mom Judi is still going on with lots of really nice things. You can visit it HERE. Today it's been 5 years since I've been a Monkey! I love my home and I appreciate it so much. I wasn't always so lucky. Mommy's friend's daughter found me as a 3-month old kitten, wandering around an alley. I was hungry, thin and full of fleas. I was so hungry when I got here that I tried to eat my new Mommy's hand! I soon realized that there was plenty of good food to eat so I could finally relax. ...I've been relaxing ever since. I've got it good! I love my home and I love all of you. It's been awhile since I gave you all an update about how things are going. The medicine the vet gave me for my crystals, and all the wet food and a brand new ceramic fountain, have all worked to make me feel better. I no longer pee outside of the box and I feel great! I also made a new friend. I call him Pinky the Pig. He's just my size and, unlike Sweet Pea, he doesn't mind when I tackle him. Here's a photo of Pinky and I hanging out on the table. Sweet Pea and I are getting along just fine. In between all the tussling she pins me down and cleans my ears. I can tell that means that she loves me and it's just a matter of time before she is putty in my paws. I'm very excited today because I get to announce the winners of our Cascades Boutique giveaway and The Beaded Tail gift certificate for the international entries. I still love my teepee but I'm a little mad about having to share it now. Mommy had a party on Friday night and Deli stole a vegetable samosa from the hors d'oeuvres platter and brought it into our teepee to slobber on it and then eat it. It smells a little funky in here now. I'll put my squabble with Delilah aside for now so that I can announce the winners of our giveaways! There were 28 U.S and Canadian Entries and we drew the 11th Can/U.S. comment by using random.org. 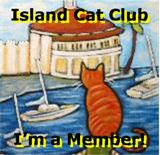 Congratulations to The Island Cats! You won a teepee from Cascades Boutique! 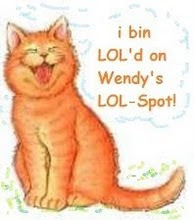 Wally and Ernie, just a little friendly advice from a fellow Mancat - don't let Zoey in there with any samosas! We also had 8 international entries and we drew the 5th international comment by using random.org. Congratulations to Ginger Jasper! Your Mum won a $20.00 USD gift certificate from Beaded Tail! Winners - please contact our Mom through the contact button on our profile and tell her your mailing address. We are very lucky cats! Cascades Boutique asked us if we would like to review one of their recycled cardboard cat houses. Of course we said yes. They are made out of recycled fibers and water-based inks, so they can be recycled again once you're done with them. We had a choice of a teepee or a log cabin. Delilah wanted the teepee, so I agreed (what's the point in arguing with a tortie?). If you know me at all, you know that I am obsessed with cardboard boxes, so of course I love this teepee. It has the consistency of a nice comfy box with just a slightly different shape. I also think I look ruggedly handsome in my new tent. I love this teepee and I could sleep here all day. Unfortunately Delilah wants her turn. I can feel her presence somewhere close! Delilah has always loved tents and cubes, so she loves the shape of it. This teepee incorporates both my love of boxes and Deli's love of tents, so I have a feeling we're going to have to learn to share. Bella wanted nothing to do with our teepee. She rolled her big, googly eyes at us and asked why we would choose camping out over a big bed of memory foam. She can be so snobby! Here comes the exciting news - we get to give one away! The winner can choose either a log cabin or a teepee like ours. This drawing is for people who live in North America only. If you're in North America and want to be entered, simply leave a comment with your cat house preference and we'll draw a winner from all the commenters. Cascade will ship the prize to the winner free! We will announce the winners on Monday! We will close entries on Sunday at 4:00PM EST. Good luck! In the meantime, If you would like to purchase a cardboard pet house, you can get a 25% discount by using the coupon code MONKEYS at checkout. This offer is valid until September 30th. I guess you can tell by the title of this blog that I've finished my evaluation of Tiki Cat food and I absolutely love it! Mommy loves it too, but she says it's because the ingredients are great and it's good for me. I am a hearty eater and I love everything with any kind of fish, but Mommy was completely surprised how much I loved this food. I purred and grunted while eating some of the flavours which is something I've never done with any other food. My favorite was the Honolulu Luau (tuna on rice with crab surimi)! Bella was also in love with this food, but she was much pickier than I was. She didn't like any of the mackerel or sardine flavours, but with all the tuna, salmon and crab flavours, she cleaned her plate! Samson was the only one of us that didn't like it at all, but we only had the fish flavours and he doesn't like any fish - never has. Samson even turns up his nose to tuna! I recruited Sweet Pea and Gabriel to get the 'young cat opinion'. They didn't say much, but you can tell by the way they're eating, that they really loved it. Their Daddy gave Gabriel the medicine for his crystals in the food and he didn't even notice! That's why you can see him trying to keep Sweet Pea out of Gabriel's bowl. We want to thank David, from The TreatsWell Company for giving us the opportunity to test this fabulous food! It is fairly new to Canada but is currently widely available in Ontario and western Canada. For our local readers in Montreal, by September it should be in more stores, but for now, you can find it in Little Bear on Sainte Catherine West and in the Pitou Minou & Compagnons locations. P.S. While we were given the food free to test, we did not receive any other compensation for reviewing this food and all of the opinions are our own. A LONG time ago, before I was even here, World's Best Cat Litter asked The Monkeys to review the new lavender-scented litter. They sent them a bag, and of course they used it and didn't even review it, so I'm here to help them get organized. By all accounts, it smells amazing and even covers Sweet Pea-powered poop smells! It must be powerful stuff. My Daddy says it smells nice, but not overwhelming. Daddy also loves that it tracks much less than the other corn-based litter we used to use. It means less of the evil vacuum for us too! 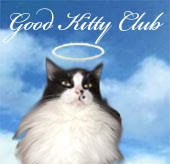 The scented litter is not available in our area of Canada , but Sweet Pea and I use World's Best, so to make up for our late review, Sweet Pea and I will demonstrate how to use the regular version of World's Best Cat Litter. Uh, Sweet Pea, you're not doing it right...the litter is supposed to be in the box first. I don't know if Canadian cats do it differently, but where I come from, the litter has to be in before you poop and you're definitely not supposed to sleep in there. She's not even listening to me, but I need to show everyone how to use this stuff, so I need to do whatever I have to to get Sweet Pea to cooperate. I hear whispering in a ladycat's ear is supposed to make them do anything! I guess in the interest of being more like my new Canadian family, I'll try it their way. Sweet Pea is so stubborn and she's ruining my first review! I've got to show her how to use the litter properly. Trying to get Sweet Pea to do something she doesn't want to do is almost impossible! My review was a flop, but we definitely use and love World's Best Cat Litter. As soon as the lavender-scented litter is available here, we'll be getting some. In the meantime I'll keep trying to teach Sweet Pea the proper way to use cat litter!